Rival managers Darren Jarvis (left) and Michael Goode. Holbeach United and Yaxley FC have been handed tricky assignments in the second round of the FA Vase. Recent successes in the competition meant both sides were exempt from the Vase until this stage. Yaxley will host London Colney and Holbeach will travel to Walsall Wood. London Colney are currently second in the South Midlands Premier Division having lost just once all season. Walsall Wood are mid-table in the Midlands Football League Premier Division. The ties wiil take place on Saturday, November 21. Both Yaxley and Holbeach are in midweek United Counties League action. 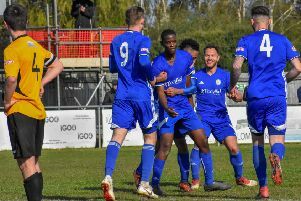 The Cuckoos have a tough League Cup tie against Premier Division leaders Leicester Nirvana tomorrow (November 3), while The Tigers have a tasty Premier Division derby at home to Deeping Rangers on Wednesday (November 4). Leicester Nirvana are currently 12 points clear at the top of the league. Holbeach are unbeaten in the Premier Division since the opening day of the season - 13 games ago - while Deeping have lost just twice and gained a creditable 0-0 draw at second-placed Kirby Muxloe at the weekend (October 31). Former Peterborough Northern Star co-bosses Darren Jarvis (Holbeach) and Michael Goode (Deeping) will be in opposite dug outs. Runaway Division One leaders Peterborough Sports seek a 12th win in 12 League games when travelling to Oakham on Wednesday. Holbeach United v Deeping Rangers. Oakham United v Peterborough Sports.